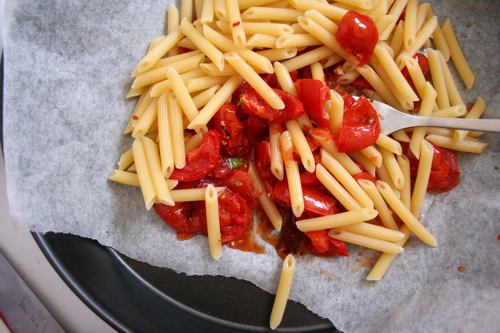 When Italians want to throw together a simple pasta, they’ll use fresh tomatoes as opposed to the crushed canned version, and call it a “salsa fresca,” a fresh sauce. It’s fruity and clean, and in the spring time I prefer it to the thicker, traditional sauces. I wanted to take this a step further, and really bring out the smoky, fruity flavors in the gloriously red tomatoes I bought at the market yesterday, so I called upon my new favorite cooking technique: roasting. Everything is done in 30 minutes and you have barely any clean up. Perfect for those of us who not only have tiny kitchens, but no dishwashers! Preheat the oven to 350°F. 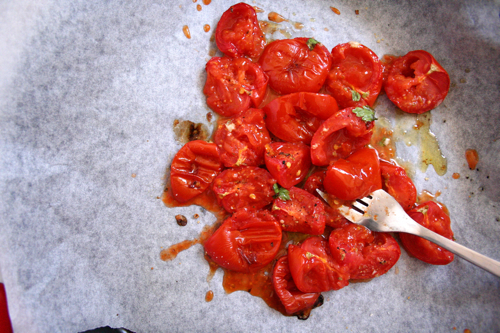 Chop the tomatoes and place them in a roasting pan covered with parchment paper. (I do this to keep from making a mess.) Pour oil on top along with remaining ingredients and give it a little toss. Bake for 30 minutes. 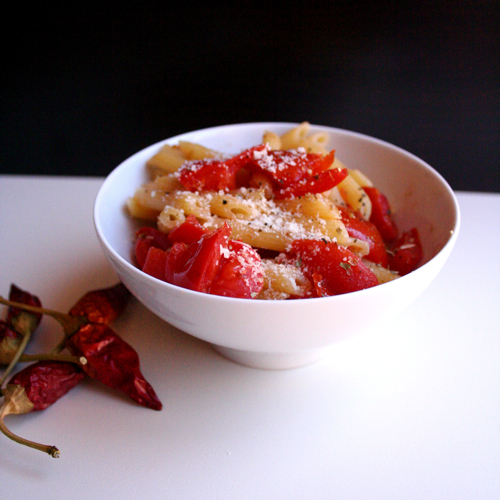 In the meantime you can prepare whatever pasta you would like to serve it with. 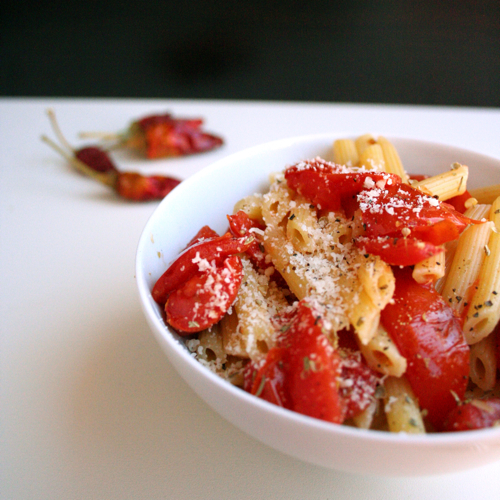 When the tomatoes are ready, mash them down with a fork directly in the pan, and toss the pasta on top. 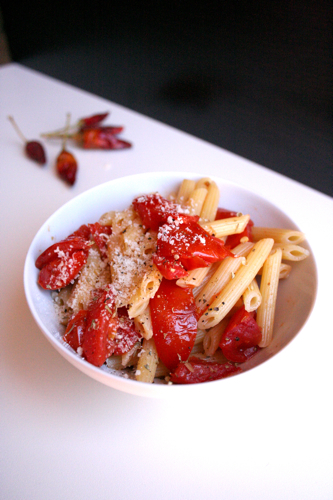 If it needs some moisture, you can drizzle more olive oil or add a bit of the pasta cooking liquid. Serve with a sprinkling of cheese and more black pepper. We have another holiday on Tuesday (yahoo!) and Manu has off until Wednesday, the lucky duck! It will be perfect weather - 75 and sunny - so I plan on doing lots of gelato experimentation. You’ve given me way too many flavors to try, but I will be reporting back my findings, don’t worry! Ah, it’s a tough job, but somebody’s gotta taste test the gelato and pancakes.